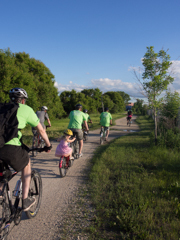 This summer Winnipeg Trails is celebrating the progress that has been made on the Trans Canada Trail. The Great Trail connects our country through a series of hiking, biking, and paddling trails, but there is still lots of work to be done! We’ll be starting things off with a slow roll, all ages, bike ride along The Great Trail starting in Kildonan Park at 12 noon. Rain or shine we’ll be slowly rolling down to St. John’s Park! Meeting up at St. John’s Park we’ll continue the fun! – 2:30 Local bands Casati and A La Mode will perform! – TCTea, cake, veggies, and more! 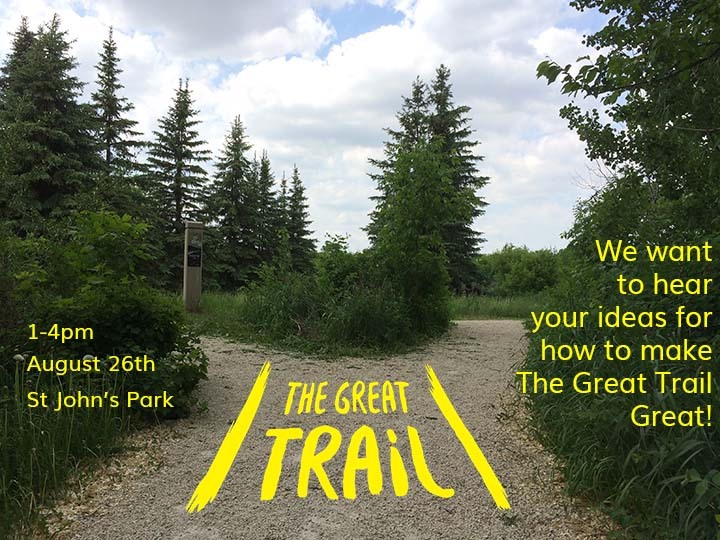 – a chance to share your experiences and opinions about the future of The Great Trail, chiming in on how and where new funding should be spent! Our Executive Director, Anders Swanson will be starting an early ride from the start of the Crow Wing Trail, heading north through the city he will attempt to cover as much of The Great Trail as he can on a special cargo bike outfitted with maps and snacks. Throughout the day he’ll be posting on our Winnipeg Trails twitter account about his ride along the trail and the improvements it still needs. You can also track his progress on this map on our website. ..and first ever Winter Bike to School Day. Commit to ride. Put a snowflake on the world map. Watch it grow. Schools can participate; teachers do a 30second survey. Canada’s Federal Environment Minister will be riding her red bike. Russia’s official twitter account approves of Moscow’s warm up ride. Right now there are 1.7 people signing up around the globe every minute. …if free hot chocolate is more your thing, swing by the Breakfast on Ice at the Forks until 10am. Meet up at Fools + Horses at noon for an informal discussion with Winnipeggers freshly returned from the international Winter Cycling Congress in Minneapolis-St.Paul. Learn what it takes to become a world-class bike-friendly city. 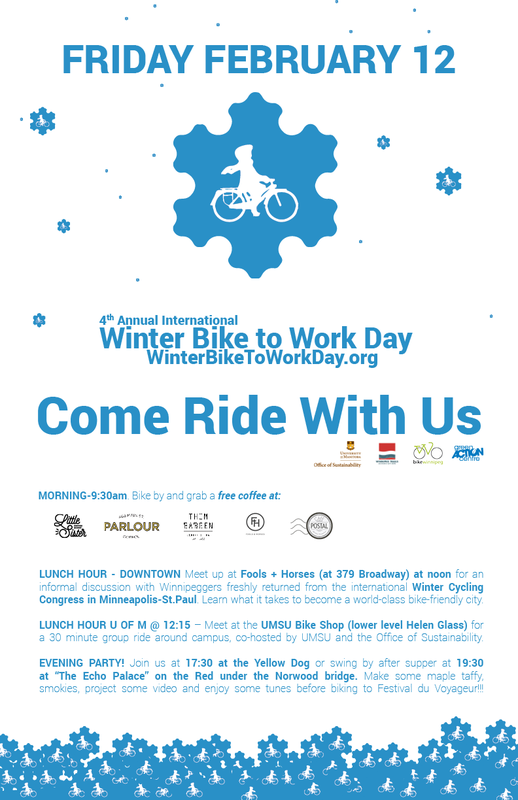 Meet at the UMSU Bike Shop (lower level Helen Glass) at 12:15 for a 30 minute group ride around campus, co-hosted by UMSU and the Office of Sustainability. Join the Jack Frost Challenge crew at 17:30 at the Yellow Dog or swing by after supper at 19:30 at “The Echo Palace*” (on the Red under the Norwood bridge). Make some maple taffy, smokies, project some video and enjoy some tunes before biking to Festival du Voyageur!!! Stay tuned to Bike Winnipeg and Winnipeg Trails for any emerging info about local events. Follow the event on Twitter or Facebook to see the latest scores and watch what’s happening around the world. *If you’re not sure where/what the Echo Palace refers to, try out the Winnipeg Trails app. If you can show us the Echo Palace gem on you phone, you will win some awesome prizes. Sunday Apr.26. 11am. Come ride to Fort Whyte! This Sunday, April 26th, join WTA Coordinator Anders Swanson for a leisurely bike ride down the Bishop Grandin Greenway to the beautiful forested and natural Fort Whyte Alive. Bring your kids or special someone along. It will be lots of fun. Meet at 11am sharp . . where the Greenway meets the Seine River. There are three other rides planned by co-hosts Bike Winnipeg! All drive together. Have a look at the details and the cool route maps. Pick whichever ride suits you the most! “If You Love the Prairies”… Come and join the Headingley Grand Trunk Trail at their AGM. If you love the prairies and enjoy observing prairie plants as you walk, hike and bike our prairie trails, come to hear Dr. Diana Bizecki Robson, Curator of Botany at the Manitoba Museum, present some of he work on the plants of the prairies and the pollinators necessary for their survival. The presentation will include photographs of prairie ecosystems, wildflowers and insect pollinators. A short AGM will precede and refreshments will be served. All are welcome! Headingley Recreation Centre, 5353 Portage Ave, 7:00 p.m.
Join Trails Manitoba from 9 am to 5 pm at Fort Whyte Alive for their AGM and workshop at Fort Whyte Alive. This is an excellent opportunity for trail builders and enthusiasts to network, discuss common issues, and plan for the future. The day will start with the AGM followed by a round table – tales from the trails, lunch, a trail walk, presentation on trail signage on the TCT and a border to beaches update. Please register before April 10 by contacting Margaret Boyechko at margaret@trailsmanitoba.ca or 633-9879. Get involved with Jane’s Walk 2015! The planning committee for Jane’s Walk Winnipeg 2015 is looking for new blood! Each year our number of walks grows and the topics become more diverse. Check out some of last year’s 24 walks – from “Ballads and Boulevards” to “History and Heroes”. This year’s Jane’s Walk weekend is May 2 and 3. What does the planning committee do? Mostly, we help recruit and assist walk leaders, including an orientation evening, and promote the weekend’s walks. Background: Jane’s Walk celebrates the ideas and legacy of urbanist Jane Jacobs by getting people out exploring their neighbourhoods and meeting their neighbours. Free walks held on the first weekend of May each year are led by locals who want to create a space for residents to talk about what matters to them in the places they live and work. All walks are given and taken for free. Completing the survey will take about 15 minutes of your time. We appreciate your help with outreach and encourage you to pass the link to the survey along to other relevant organizations you know of. The information collected will be used to assess how we can work more effectively together towards a walk friendly future for Canada. The survey results will be shared through conference and webinar presentations in an effort to raise the profile of walking and walkability. This is just a first step toward capturing what’s happening with walking across the country, leading to a broader conversation about a national collaborative and/or strategy. Please follow this link to the survey: //surveymonkey.com/r/stateofwalkingincanada and respond by Friday, February 27th. Thank you in advance for participating in this important research to better understand the walking movement in Canada! On Thursday February 5th, join Canada in celebrating Winter Walk Day 2015. Walk to school, walk to work, walk your dog! Make the effort to put on your puts, dress warmly, and go out for some physical activity. Share your Winter Walk Day experience with the hashtag #winterwalkdaymb. Walking in the most popular form of physical activity for Canadians. A walking club can help and encourage people to reach the Canadian Physical Activity Guidelines recom-mended amount of 150 minutes of physical activity a week. Manitoba in motion currently has a limited number of Walking Club Kits available. We would like to support Communi-ties in motion by offering them priority access to these kits. By organizing or expanding a walking club in your commu-nity, you will be promoting walking and the many health benefits obtained from walking. Get active with the Jack Frost Challenge! 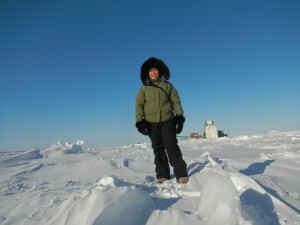 Frolic in the snow and celebrate winter Manitoba-style. Sign up a team of friends, co-workers or classmates to skate, bike, ski, snowshoe, run or walk a combined total of 130 km the week of February 7 – 13, 2015.